Many of us know that pairing designers and developers can lead to a more creative and efficient problem-solving process. It’s no surprise—many big brands around the world subscribe to the pairing model. But for those that don’t, how do we get there? How do you bridge the gap to form a beneficial developer-designer relationship? How do you support it once you have it? At recent Design Leadership Forum dinners, we’ve discussed this very idea. The Forum is a community where more than 800 design leaders at companies like Lyft, The Home Depot, Capital One, and MailChimp share honest conversations about the challenges they face at the tops of their organizations and the opportunities presented to the design community today. The community gathers all around the world to discuss these topics in person. 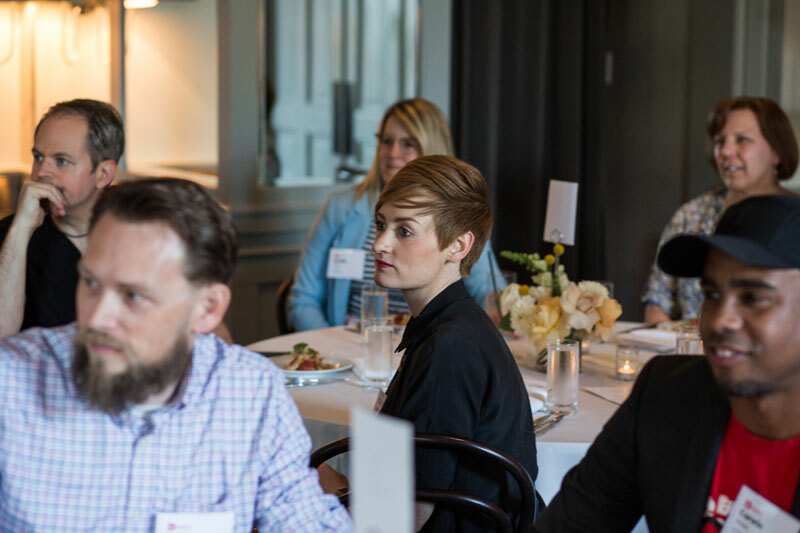 Attendees listen to introductions at a recent Design Leadership Forum dinner in Austin, Texas. Photo by Knox Photographics. At a recent member dinner, nurturing the designer-developer relationship was top of mind. Here are three pieces of advice everyone agreed on. Designers aren’t there just to make something look pretty, and developers aren’t there just to work through Jira tickets. From project-onset, both groups should attend each others’ project meetings, share user research and interviews, and help each other understand the problem at hand. Setting expectations from the beginning can curtail miscommunication midstream. As designers, our mission is to serve our users: We research their behavior, we listen to their feedback, we work to improve their experience. We should be approaching the people we work with the same way. Several Design Leadership Forum members suggested getting to know each other out of the office—go for a walk, go to lunch, visit customers, attend networking events or social gatherings together. However, you can also build empathy in the office by attending each others’ department meetings and understand each others’ KPIs and motivations. One member noted, “It all comes down to language.” Try incorporating more “we” statements, and ask how you can do better for each other. Although we can get far working from the ground up, having senior buy-in goes a long way. Members suggested tactics like involving C-levels at the base levels of a particular projects (this can be especially useful in design sprints), organizing designer-developer communication workshops, and having managers put teams together more purposefully. For example, managers can set up teams based on personality assessments. Once team leaders understand how personalities work best together, they can assemble workgroup teams better, leading to better work and healthier workgroups. What are you doing to ensure healthy designer-developer relationships at your organization? Tell us on Twitter! Do you know a design leader you’d like to nominate for the Design Leadership Forum? We’d love to know about them. Want to grow your own career? Attend one of our workshops on topics like design systems, design sprints, and design leadership. Want to read more from design leaders?